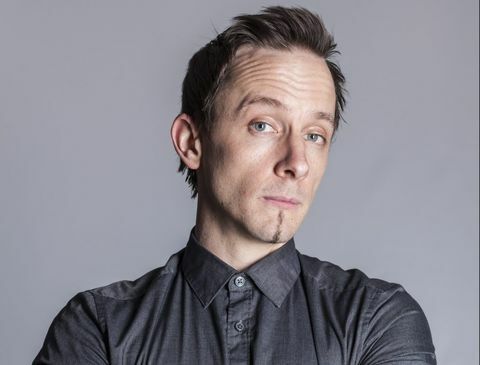 Matt chats with Aussie Mick Gordon about his work on game soundtracks including Killer Instinct, Wolfenstein, Doom, and Prey. Q: You started in bands when you were 12. Where did you go from there? Did you get a formal music education? Mick Gordon: When I finished up at 18-19, I wanted to keep a career in music, but I couldn't figure out how to do it. I wasn't a talented enough songwriter for the pop world or rock world, but at that time there were 40 gaming companies in Australia that had nobody doing sound – it was kind of an open market staring me in the face. I started producing music at home, sending out music to different developers, and after a while I started getting call backs. Very luckily, I started working from there. Q: What was your big break? Or was it a series of smaller breaks? Mick Gordon: A good buddy of mine once said, "You don't break into the game industry, you ooze into the games industry." But if I had to pick one thing, the biggest thing would be meeting my mentor, Charles Deenen. I've been mentored by him for many, many years now – about eight or nine years – and he's taught me everything I know. He's one of those original game audio guys who has been making stuff since the late '80s. He was on the Need For Speed franchise for many years, and heading up audio at EA for a number of years. He's done so much: he's worked on 200-300 games, something ridiculous. If you check out his stuff he does for Battlefield, Call of Duty, and other big franchises, you'll hear his sound. And his sound is just something that I'm trying to copy, that's all I'm trying to do. Q: At what stage of the game creation process do you get the call, and how long do you have to put something together? Mick Gordon: It really varies. Sometimes you get a call, and it's literally a couple of days. We've had a call on a Monday for stuff to be delivered on a Friday. Other times it can be years. We're working on a project now that I'm just about to finish up, and I've been working on it for about three years at this point. Q: Do studios say "this is our budget", or do they say "here's what we have in mind – what will it cost?"? Mick Gordon: Again, it can be either/of. Typically they have an idea in mind about where they wanna take the music in their game. What I'm finding these days is they're very interested in being open about that sort of thing, and engaging in a conversation. So often I'll spend several months just kicking ideas back and forth about how to approach a certain project: what we can try, what we can do? Once all that stuff is nailed down we start looking at scope, which is how much work is involved. Sometimes it can only be a couple of minutes of music – five or six minutes – sometimes it can be four hours of music. So it's different each time. Q: How much direction do you get from a studio? I imagine non-musos talking about music use a lot of interesting descriptors to get their ideas across. Mick Gordon: What we try to get across in the beginning is this shared language. So when I say to you "I need it to be a lot more heavier", you know that I'm talking about the same thing you know, right? We try to establish that sort of thing in the beginning, because music itself is very subjective, and it's very difficult to create a language that describes such a thing. It's very important to nail that stuff in the beginning, so 12 months down the track when you need to do some quick feedback, you very clearly know what "heavy" means, and you know what "distorted" means. It's always different for each project too, which is cool. I find often I enjoy feedback from all over the team, so it's not just the audio people. I really enjoy getting feedback from the QA people and the artists. The artists always have really great concepts and ways of explaining music and what they hear in their heads. Programmers are always cool 'cos they always listen to death metal. Q: Do you give a bunch of finished music to the studio to insert into a game, or do you oversee that process yourself? Mick Gordon: Again it's either/or. Some projects I'll travel to the studio and spend a few weeks in-house, and we'll work very hard to get the music to play back the way we want it to. Making music for a game is a two-part process: you have the actual making music part, then you have the actual part of getting it into the game and to play back in the way you want it to play back. That can be a very long process. Often that second part I feel if I'm just handing that over to the team, I'm missing out on half of the experience. So it's important to be able to get in-house and do that sort of thing. I think it creates a better product in the end if everyone is working on it altogether rather than segmented. Q: Who owns the finished product? Mick Gordon: It depends on what sort of deal you strike with different companies. Some companies like to take all of the music for the franchise. Other companies like to grant royalties and things for soundtracks. There's no one standard way that games get made, and each time we approach a project it's always different. Q: Game sound design seems to involve a whole lot of bonkers experimentation. Is it the same for the musical side of things? You seem to mess around with waveforms a lot and use weird old instruments. Mick Gordon: Yeah all that smashing stuff up for sound design is interesting, but it's only five percent of the job. The other 95 percent is you stamping on some concrete in some boots to get footstep sounds. That's the reality of the job. Then every now and then you might be able to go outdoors and throw something at something else. With music, I like to start a project by destroying everything I know – that's something that I learned from Charles as well. You throw everything out, go right back to the beginning, and try to re-learn things. You go off on a completely different journey. That might result in working with different synthesizer concepts, working with live bands, trying to come up with different sounds with different instruments, working with a choir… but the point is you always try to take a unique approach with every project. Q: You've composed for a wide range of styles: you collaborated with a Viking choir in Sweden, and representatives of the Nez Perce tribe in Idaho. How do you approach a genre or style you aren't intimately familiar with? Do you just immerse yourself in it for a while? Mick Gordon: Absolutely you do that. The first thing is to understand that music is really all the same language. Even though it might be a tribal thing or a Swedish choir in Gothenburg, everybody is working with music, and music is a common shared language across all those things. Of course, the scales might be different, the tuning might be different, the time signatures might be different. But essentially, they're all trying to create some sort of musical rhythm and melody out of instruments, whatever their confines. So once you look at it like that, everyone is starting from the same point. It's the journey they take that results in tribal music or the Swedish choir. So I try to draw it all back down to the beginning and destroy everything I know and kind of start again. Humans are really born to absorb music for sure, it's a very natural thing. Q: How long did it take you to be able to throat sing for Jago's Killer Instinct theme? Mick Gordon: [Laughs] That was a very hard thing. It probably took me about a week. I haven't done it for a while. You're not gonnna ask me to do it are you? It's kinda weird. You've gotta hit that point in your throat where your voice box is opening up, and there's a point where it starts to vibrate. You know when you grab a balloon and you've got air in it, and you pull it apart to that perfect point where it starts to produce a pitch? You're kind of doing the same thing with your vocal chords there. At some point they start to vibrate together and create a pitch. And then as you practice it, you can learn to control it a little more. Tibetan singers can take that and sing notes on top of it through harmonics through their nasal chamber, which is just incredible. I haven't gotten to that at all, that's years of dedication. Q: You worked with fellow Aussie Tex Perkins (frontman for The Cruel Sea) on The Old Blood. Did you bring him in? What was the arrangement there? Mick Gordon: Jens [Matthies] who was creative director at MachineGames on Wolfenstein, he really wanted to do a cover of this old trench World War II song called "The Partisan". A whole bunch of people have done different versions of it: Leonard Cohen did a really famous version, and Joan Baez – it's a pretty well-known song. They wanted a version for The Old Blood. Whenever we sit down to do one of these projects we create a list, and on that list are all the people you really wanna work with. So right at the top you have your number one absolute dream person you'd love to work with, and usually what happens in these sort of things is you get down to number 20. When I drew up this list, I had Tex Perkins at number one. We reached out to his camp, they really loved the song, and he jumped straight on that. It was really quite easy. It was a great experience: he's a really, really amazing musician. He came into the studio and smashed it out – it was extraordinary. I've never witnessed anything like that before. Q: I love your work on the Doom soundtrack. However, the original is one of the most iconic game soundtracks ever. Was it intimidating trying to come up with something to match stuff like that classic E1M1 riff? Mick Gordon: Of course! What I learned through that process though is that you can never top it. So what do you do? You can look at maybe reworking it, remaking it. I didn't feel like doing that because I feel like at the same time it's not really doing it justice. I feel like that existed in 1993 as that thing, and that was the best it's ever gonna be – you can't top that. The second thing is to do the completely different approach, but I always feel that's very disrespectful to a franchise. I really don't like when I see a franchise from my childhood being brought to a new audience, and then have completely different music I don't identify with. For some reason, I find that really weird. 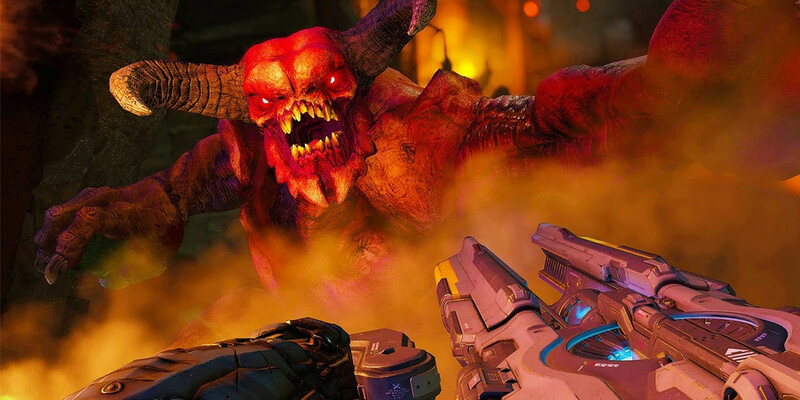 So I tried to find what Doom meant, and we started looking at the sheer aggressiveness of the Doom Slayer, and the violence of the whole world, and how it was a very tactile thing – it was very hands-on. And we started building sounds around that. And once we got that new Doom palate, we were able to incorporate some of those old Doom ideologies musically. And that way we were able to get a nice happy balance. It was never about chopping it up, it was all about treating it with the utmost respect for sure. Q: Is that a nine string guitar you are playing on some of those tracks? "BFG Division" and some of the others, and then for "Flesh and Metal" we went crazy and went nine string guitar, which is insane. I actually ended up getting rid of it because it was just impossible. I gave it to a good buddy of mine Fredrik who is a guitarist for a band called Meshuggah. He absolutely loved getting it. Q: Are you bringing the other guitars to PAX? Mick Gordon: I have an eight string here with a couple of big speakers and a couple of subwoofers, so hopefully it's gonna get nice and loud. Q: Is a full tour on the cards? Perhaps with an orchestra? Mick Gordon: To do that sort of stuff, it does cost a lot of money. I've got some buddies in the EDM world, they put these really big shows together, and they've sent me sneaky little shots of their invoices, and they run into the millions. It's crazy. If there was a chance we could make it work, absolutely we'd totally do it. But that sort of big touring show doesn't look possible at this stage. However, some other things might be: guests spots at shows, or different events that happen around the world that celebrate video game music. If we can line it up we might be able to make that stuff happen. Q: What's a game whose soundtrack you really like? Mick Gordon: My favourite game soundtrack of all time is a weird one. It's not like a classic one: Mafia. The first Mafia I thought was absolutely brilliant, because it came out about the same time as Halo (which of course is another great soundtrack that I love). And while Halo was a modern interpretation for video games, in Mafia the music in the cutscenes just blew me away when I heard it. Q: You're currently working on Prey and first-person horror exploration game Routine. What are you doing for each? Mick Gordon: Prey is up in a space station, and there's some weird stuff going on, so the music is gonna surprise people a little bit. It's the polar opposite to Doom. It's lots of really interesting western guitar textures and stuff to simulate the loneliness of being stuck in space. For Routine, I'm doing all audio for that. It's myself and three buddies, and we gave ourselves a challenge a couple of years ago to make a AAA quality game with four people and no money. It's been a really interesting experiment. We started Routine about 2012, and back then we were going more of an '80s flavour, but we felt it hasn't worked out too well, so we're now pushing a little bit older – a real '70s vibe. What I mean by that is a really functional science fiction. It's not like touch screens, it's big clunky switches and big leathers and all that sort of thing. ◆ You can check out more of Mick's work at his official website.